Moto E comes with a vanila Google keyboard, which you can find it in Google Play store. Please note, Moto X, Moto G and Moto E use the identical Google keyboard, so this guide is also applicable for Moto G keyboard and Moto X keyboard. How to use Emojis in Moto E? 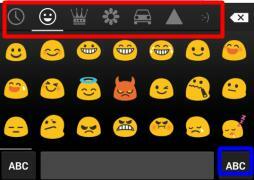 Since KitKat 4.4, Android start to support colorful emojis natively. In Google keyboard, you can find a lot of emojis in different categories. To input emojis, you tap the emoji button in Moto E keyboard. Emojis are organized in different categories. If you want to return to text input mode, tap the ABC button. Please note, the emojis are available for messages and emails, other supported apps only. If you find your Moto E keyboard does not have the emojis button, very likely, the app does not support emojis, for example, web browser does not support emojis. In addition to system language (please follow this guide on changing Moto E languages) , you can also add multiple languages to your Moto E keyboard. 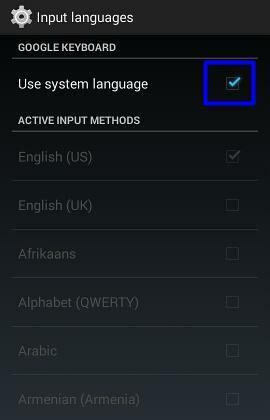 In your Moto E, go to Settings–Language & input. Tap the settings icon next to Google keyboard as shown below. By default, Google keyboard uses the Moto E system language. You need uncheck this settings to proceed as shown below. After unchecking the “use system language”, you now can select many more languages to your keyboard. Moto E keyboard can handle multiple languages. Tap any available languages that you are going to use for your keyboard. 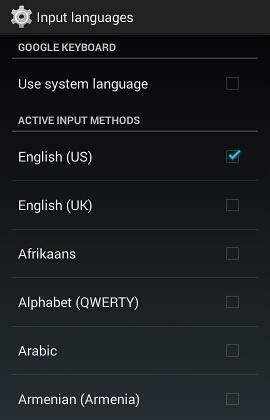 The checked languages will then be added to your Moto E keyboard. 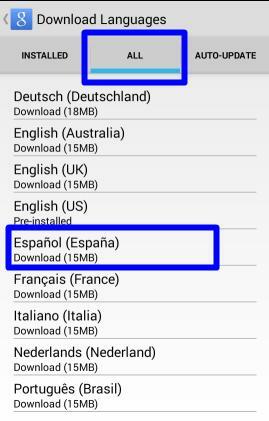 How to switch languages in Moto E keyboard? 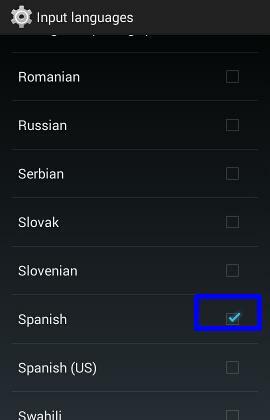 If you added more than one language to your Moto E keyboard, you can switch it on-fly. 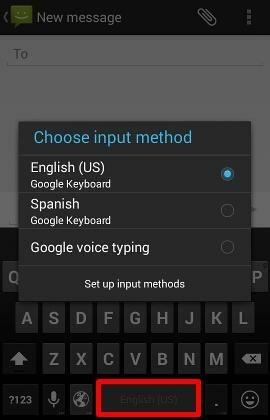 To change Moto E keyboard languages, tap and hold the spacebar button until you get the options window as shown below. You can then switch the input language fro the Google keyboard. How to use gesture typing in Moto E keyboard? Moto E keyboard also supports gesture typing. You can slide your finger across the letters of the word. You can release your finger once the word you want is displayed in the floating preview or in the middle of the suggestion strip. To select other words in the suggestion strip, touch it. When using gesture typing in Moto E keyboard, it is not necessary to use the spacebar. After you lift your finger, it will automatically insert the space and continue a new word. If the word you want to use is not shown when using gesture typing, you have to manually type it. You can use Google voice typing for Moto E keyboard. In other words, you can type by speaking. 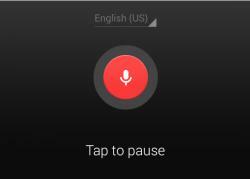 To use Google voice typing, touch the microphone button in the Moto E keyboard. You can start to speak once you see the red microphone image. Google speech recognition engine will convert what you speak to text. If you are using English, you can even speak “comma”, “period”, “question mark” and “exclamation mark” to enter punctuation. By default, Google voice typing using online speech recognition engine if internet connection is available. It is possible to use offline speech recognition engine if you are not always connected. You can go to Settings–Language & input. Tap the setting icon next to Google voice typing. 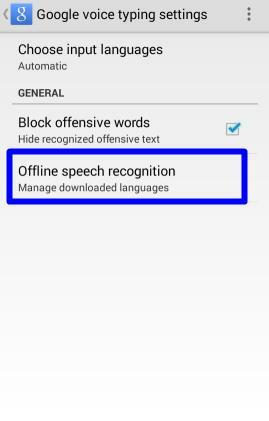 Then tap “offline speech recognition” to download and install additional languages for offline Google voice typing. You need switch to All tab to see all available offline languages as shown below. Normally, Google voice typing is smart enough to know the language you are using. So, most of the time, you can just leave the input language for voice typing as automatic (default). If the voice typing gets wrong language, you may manually set the language. 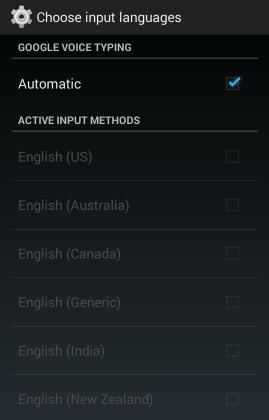 Tap the “Choose input language”, uncheck “Automatic”, then you can manually select the voice input language. How to add your own personal dictionary to Moto E keyboard? Moto E keyboard allows you to add your own personal dictionary. This means you can add your own words to your personal dictionary in Moto E.
Not only the words, but also the optional shortcuts, can be added to your personal dictionary. Moto E keyboard will remember them, and use them as the first choice. To add words to your personal dictionary, go to Settings–Language & input. Tap the setting icon next to Google keyboard. Then tap “personal dictionary”. You can add words or phrases, and corresponding shortcuts (optional) for the words as shown below. In this tutorial, I added “Moto E Guide” into my personal dictionary. I also defined a shortcut “zmeg” for it as shown above. 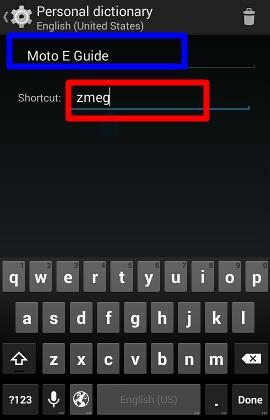 Now, whenever I type zmeg, Moto E Guide will become the first choice. 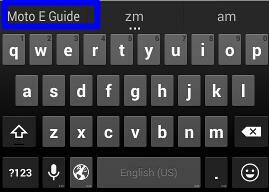 Actually, after I type “zm”, my Moto E keyboard already suggests Moto E Guide. 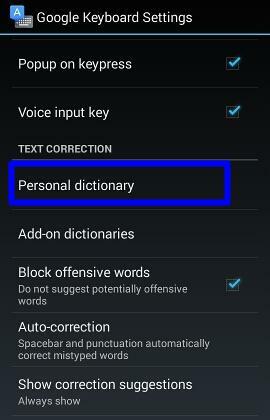 Personal dictionary in Moto E keyboard is a very useful feature and can save you tremendous time if you use it wisely. Because Moto X, Moto G and Moto E use the identical keyboard, this guide also applies to Moto X keyboard and Moto G keyboard. Do you have any questions on using Moto E keyboard (or Moto G keyboard, ot Moto X keyboard)? Please leave a comment if you have any problems or questions on how to use Moto E keyboard (or Moto G keyboard, ot Moto X keyboard). How do I setup 3×4 keyboard in moto e ? Google keyboard does not have this feature. You may have to try some other third-party keyboard apps. You need find a 3×4 keyboard in Play store. Google keyboard does not provide 3×4 keyboard. You can set any keyboard as default. hello. i m using moto E. pls let me know where is ‘Enter’ button in keypad? like if someone want to write different lines than where is ENTER button? Google keyboard is smart. It will detect whether a return key is needed. When you want to do a search, it will have search key; when you want to type a quick note, you will get a done key. This works most of the time. But sometimes, it may fail to work properly. For example, in some regions, people like to write long sms. They will find there is no return key. Anyway, if you cannot find the return key for a new line, it means Google thinks you don’t need it…. Your only choice is to use other keyboard. There are quite a lot good keyboard in the Play store. How do you turn the vibration on the key pad off? I’m using a Moto E.
In settings -language and input,tap the gear icon next to Google keyboard. Tap preferences. Then you can uncheck vibrate on keypress. Google keyboard has Enter (return). Hit the “Shift” key, you will find it bottom right corner. yes, Moto E supports Arabic language. The Google keyboard also support this language. Anyway, you should check it before buying it because the firmware in different regions may be slightly different. You can find the answer in last comment. Predictive text or auto correction is a keyboard feature. You can turn it off in Settings–language & Input, tap settings icon in the right for Google keyboard, tap text correction. You may turn off Auto correction, and next-word suggestions. How can I copy text in moto e? Previously this was Woking but corrently not working. Tap and hold ant characters, drag the handler to select more character. Once it’s ready, tap the copy button in the top of the screen. To paste, tap and hold current input area, tap paste. How to inactive the dictionary mode? Do you mean personal dictionary? You can tap the entry, then tap delete icon to remove that entry. You can also use direct message widget for any specific contacts. yes this i know ,but how to send business contact no means i want send one contact no directly to other contact no by messaging. if you cannot find that language, it means it is not supported by the keyboard. You may have to check other third-party keyboard. What is third party key board ? where is enter key in moto E ??? There are many keyboard apps in play store. You may try SwiftKey. The enter key may be replaced by emojis of you are typing a message. It will be replaced by search our go button if you are typing web address of the address bar. So, it’s context sensitive. If you are editing a document or writing an email, the bottom right one usually is enter key. You may tap and hold it to switch to emojis or other options. Go to settings–language and input, tap the settings icon next to Google keyboard, uncheck “next word suggestion”. Hi… Dear sir. I am jayant. questions is how to see Gujarat language in web site see? Plz reply me an i waiting your answer. Not sure. It probably depends on the website. If the website uses UTF-8, you should have no issues. Anyway, I am not familiar with this. You need install other keyboards from play store. The pre-installed Google keyboard doesn’t provide 3×4 keyboard. In clock app, tap the alarm, tap the music symbol, then you can change the alarm tones. You can customize it similarly as ringtones. Yes, you can use most Bluetooth keyboard. The procedure is covered in this guide. If the language is not listed, it means the language is not supported by Google keyboard. You have to use other keyboards that support this language. The offline voice search actually is for voice commands only. What you downloaded are the voice recognition file for offline use when you are offline or your connection is not good. If there is no internet connection, Google cannot connect to its server to perform the search. Settings — language & input, tap the setting icons next to Google keyboard, tap auto-correction, you can choose Off. The default is modest. I don’t like using the qwerty keypad. Why doesn’t it have option to use the phone keypad????????? Is there a way to do that? In the Play store, there are a few 3*4 keyboards. You can try them. For a touch screen qwerty keyboard normally works better. 3*4 is good for a small physical keyboard. Very likely, you tap the keys too slow. The first row of the keys in the keyboard will become numbers (or even more options) if you tap and hold the key. You may chekc the settings–accessibility — touch & hold delay. Set it to Medium. Can someone please help me with disabling Predictive text from my MOTO G 2nd Gen.
Settings–language & input, tap settings icon for Google keyboard, tap Text correction, you have all options there. You can turn off auto correction of adjust the auto correction levels, or turn off next-word suggestions. Hi I am using the Moto X 2nd Gen and I am wondering it there is a setting to turn on suggested emoticons when a word is typed. Ex: “The football game was exciting.” On the 1st gen Moto X the word football would be blue and when you thumb over it a suggested football emoticon would appear. This is not a function that I have found on the 2nd Gen… Any help is appreciated. You may try SwiftKey keyboard. It has a emojis prediction feature. hello sir, can u help me with the disabling vibration while typing messages?? Go to settings – language and input, tap settings icon for Google keyboard, uncheck vibrate on key press. You may have to reset the Google keyboard at Settings–Apps–Google keyboard. Tap clear data, and clear cache. Then reboot the phone. Hi.m a new moto e user…can smone pls guide me on how to switch off predictive text fr Watsapp bbm n other such applications?? Predictive text or auto correction is a keyboard feature. You can turn it off in Settings–language & Input, tap seettings icon in the right for Google keyboard, tap text correction. You may turn off Auto correction, and next-word suggestions. Hi, I am not able to enter continuous capital letters in my moto e. The shift key in bottom left will allow only 1 capital letter, but I have to enter whole sentence in capital. Tap it twice to lock it. Hi how can we edit a number on the dialpad while a call is in progress? If the call is in progress, why do you want to edit the number? If you need tape some numbers (like phone banking, or support hotline), you can move the phone away from your ear to wake up the screen (or tap the power key). Then under Hangup (in red background), you can find the icon for dial pad (the first one from left, 10 dots). Tap it to input. my Moto G keypad is not getting displayed while typing anything, instead of keypad speaker is getting on. In Language & input setting – in default option it shows “Emoji – iWnn IME: instead of US keyboard. You can tap it to change. Do you have Google keyboard in the list? I want to make a letter capital while using Gesture typing. How do I do it? Double tap (tap twice quickly) the shift key will lock the keyboard to upper case. Is there a way to disable the Emojis on the Moto E and use the better and more clear ones from the app? Bc I’ve tried and isn’t working it just goes back to my original crappy Emojis. You can try SwiftKey keyboard. I guess what I’m trying to say is I want them to look like the ones on a iPhone or iPod but I dont think it’ll work. But i did dwnld SMS Pro and they worked, but in order to do that I have to disable my original messaging and access my contacts through the app SMS Pro to send a text message . And for that I think I have to keep an internet connection…., which I don’t want to do all that. W/ my iPod all it had to do was access a few things and then simply made its way as an option to my keyboard. Emojis support is built into the KitKat. You cannot disable it. You can choose not to use it. I can receive emojis from a friend (who uses a different phone/network) but am unable to send them myself. When I try, the space where the emoji should be is left blank. The old school smileys work – e.g. 🙂 😛 – but when I send them they display as little green alien emojis on my friend’s phone. Is this fixable? It depends on phones. Some vendors may have a proprietary implementation. Sorry. It is probably a reply for another comment. Try to set the language to English, use Google keyboard and use the stock messaging app. All calls (incoming and outgoing) are recorded in call history. You need some third party apps to process these raw data if you need statistics. Probably his phone doesn’t support emoji. Did you install any other keyboard apps? You can unlock moto e with your Google account through android device manager from a pc. Why can’t I use my emojis on my Facebook app? Tap and hold the enter key. Hi everyone i have a problem, today i was using my moto E and noticed that the (a, q, caps, 1, @, ~) don’t work. Did you check the language settings for both the phone and the keyboard? What characters did you get when tapping these keys? You can try some other keyboard apps, e.g., SwiftKey. Sometimes, a reboot may also solve such strange problems. Dear Sir, My new Moto E 2nd gen operate in only double click for open any application. What should I do for Single Click. Please reply as soon as. Did you turn on TalkBack in Settings–Accessibility? 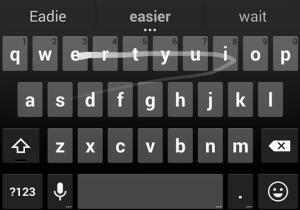 Other phones offer you to add a custom word while typing. Can the Moto G do this? It is very annoying to have to go to a separate ‘special’ list each time to add a name or local word. Other phones offer to ‘add to dictionary’ as you type. 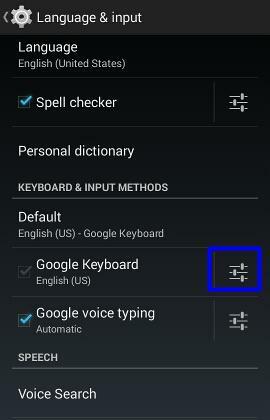 You can user personal dictionary for Google keyboard in settings – language and input. Yes but that’s not as you type which other phones all seem to offer. E.g. Nokia Lumia, Amazon Fire, they all add as you type and learn to predict better. Not sure if it’s Google or Moto to blame but it’s a poor system. I guess you probably turned off some setting under text correction for Google keyboard. The Google keyboard actually is quite good in learning your typing habit. If you need alternative keyboard, you can try SwiftKey. my mote e shows unfortunately, google keyboard has stopped. how to overcome this problem. i can’t able to type anything. Reboot the phone (power off and then power on) to see whether the keyboard persists. When you tap the emoji, it should be shown in your message. But the recipient may not get it as emoji depending on the phone OS. When typing, do they display normally? How can I delete a line of text on Moto E? It’s up to the app you are using. by mistake, in my mobile moto e 1st gen – input language has been changed to some other language including keyboard, other than english. now i want to restore the english language and what i can do now ? You can guess based on icons. The relative location of the settings are identical for all languages. While texting a message, I wanted to add a word..
for example ‘momos’ to my personal dictionary, how do i do that.. Previously I used to find a prompt “add this to personal dictionary”, but now I couldn’t find it. I was using Personal Dictionary optional shortcut (type in one word and ENTIRE SENTENCE would appear). It was working fine, but will no longer work. I type certain sentences repeatedly and was trying to save time/typing. Any suggestions on what happened, or how to get it working again? The info is still in the phone, I have tried re-entering. Sir, how can I change my text colour …plz guide me sir in changing my keyboard colour..
Sir I’m using moto e with kitkat4.4.4V….how to change the font colour..is it possible in moto e?? Some third-party keyboards has various themes. You may try SwiftKey keyboard, which is free with many themes. Google keyboard does not offer theme options. Hi, I have inadvertently disabled the google keyboard option in my Moto E phone. Now, my phone has got locked, to unlock it, i couldn’t input my password. Is there any way to get in, without doing a hard reset. Thank you. Sir, how to use keyboard moto e USB ,or otg bired . Moto E 1st Gen doesn’t support USB OTG. So you can only use Bluetooth keyboard or mouse. Moto E 2015 supports OTG. Can you still get personal dictionary in Settings–language and input–Personal dictionary? You can install other keyboards. Some offer full keyboard. Not sure. But you probably have to reset the phone. You will lose all data that are not backed up. This has been raised several times in the thread, but never yet had a full answer – often because people did not give enough detail or did not answer your return question. I hope to get it sorted for myself and all future people with the same issue! 1. My Daughter now has a Moto E using the Google UK Keyboard. 2. When she sends an emoji via the default messaging app, it appears in the original message when she types – but after clicking send it leaves a blank space. i.e. it just disappears. This is even when sending nothing but the emoji. In such cases it just sends a blank space. 3. The recipient (me in this case, using an iPhone 5S on IOS) receives no emoji. I get only a grey speech bubble to show that she has sent an empty text. 4. Her messaging app shows that she has sent a blank text. The emoji is no longer present. My feeling is that it is not just that the iPhone does not recognise the emojis being used (I wondered if the phone recognised that it was sending to an iPhone and made the emoji disappear). When she sends an emoji to my wife – the same thing happens. My wife has a Samsung Galaxy on Android. What I can say is that the emoji appears in the line of text when typing – but immediately that you press the send icon, it disappears (and does not send). Sending emojis via email is fine. It sounds the problem is not due to keyboard, but very likely due to messaging app. What happens if you send the message through Hangouts? In Moto E, you can choose Hangouts as default SMS app. In Messaging app, you need make sure the SMS encoding method as “Automatic”. Open messaging app, tap menu key (3 vertical dots in top right), tap settings, make sure the encoding method is automatic. Sir ,I m a user of moto e I want to change the white display which is very bright at night time in android 5.1 version . White background is part of Google Now. You have to use other launchers if you don’t like the white background. I use the MotoX, 2nd gen. I have some words that I “saved” somehow. Example: the word -“because” always comes up as “becuase” as the default, but it is no where in my personal dictionary. I can’t seem to find where I can delete this and the other words I have that I don’t want. Any suggestions? You just correct it a few times, the keyboard will learn to change. Does the moto e 2nd generation have somewhere where u can stop your keyboard from vibrating when I txt? Yes, of course. It is under Google keyboard settings. In Settings–language & input–Google keyboard–Preferences. Disable “vibrate on keypress” and sound on keypress as well if you wamt. You can install Google handwriting input app. Then you can write, instead of typing. I recently disabled voice search, now touch sounds on one of my game apps doesn’t work. They are not related. You should check the settings inside the game. Not sure about the issue. It can be caused by Facebook app. you can try to update all apps in play store. Do you mean you got problems when using a browser to access Facebook? It would be possible because the web version doesn’t work well in Android. You can change Google keyboard theme in Settings – language & input. Is moto e3 power support one thumb keypad??? probably not. You should check whether Moto E3 is listed as supported devices for the keypad. In keyboard settings, you can disable auto correction. Not sure about that setting. You can turn off the symbols in Google keyboard (Gboard) settings (Settings – language and input – virtual keyboard – Gboard – preferences – long press for symbols. Did you find other languages in the list? Google probably doesn’t offer this language in voice typing. You can disable voice typing key in Google keyboard. You can change Gboard settings in Settings –language & input –virtual keyboard–Gboard–preferences. You cna also disable Google voice typing in Manage keyboards. On the top line of the of the key board (the “qwerty” line the keys have little numbers above and to the right of the larger character. What are these numbers for? Is there a “second” function”? You can tap and hold (long tap) these keys to use these additional characters.